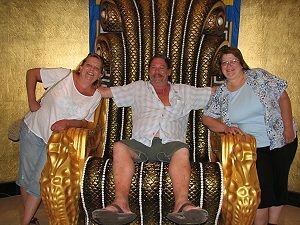 We stayed at this super fun location in Key Largo, Florida during November, 2014. 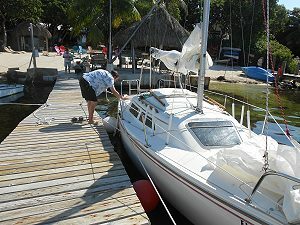 Key Lime Sailing Club is a vacation rental like Abbys, but a lot farther South (like 1300 miles South). They are located on the water on a sheltered bay next to Key Largo. They have a quaint Tiki Hut right on the water. It's a great place to hang out chatting with other guests or the attentive staff. They have a collection of water toys like kayaks, snorkeling gear, paddle boards, and bicycles. Here's the BEST PART: if you are into sailing, your cottage comes with use of a 22 foot sail boat. Don't know how to sail? They offer lessons. The owner also offers sunset sails on his Custom 40' Catamaran. While the place was a bit tore up due to failures of the local bureaucracy, our stay was great. Paul, the owner, and all his staff made us feel very welcome. 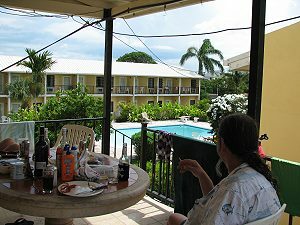 The place is surrounded (walking distance) by some of the best bars, restaurants and a Cuban coffee stand on the island. We will defiantly be back. We stayed at this cool location in New Orleans, LA during December of 2012. The last time we visited NOLA was during our honeymoon 25 years prior. 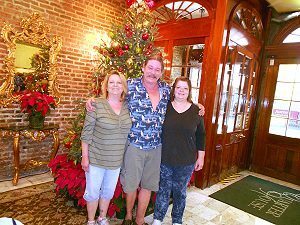 The Quarter House is a time share resort located in the French Quarter. Being in the French Quarter it is walking distance from the rest of the historical area. Also it's close to trolley routes if you want to leave the quarter. Right next door is a great bar, Sneaky Pete's to hang out in after the rest of your party has gone to bed. We stayed at this relaxing location on the backside of a trip to Atlantis. Orange Hill Beach Inn is a quiet family inn located across the road from a beautiful beach. After the luxury of Harborside this was a quiet place to spend the last few days of our vacation. Got to love the Honor System at the place's bar. We had a great view from our 2nd story deck, right next to the pool. Food was great there too. Did not feel the need to go anywhere. We stayed at this relaxing location on the front side of a trip to Atlantis. On Harbor Island we stayed at Tingum Village Hotel, a quiet family inn located across the road from a beautiful beach. Harbor Island is a quaint place with the usual things to do in the Bahamas. The beaches have pink sand, and you get to ride around on souped-up golf carts. Folks there are so friendly. They gave Clay a nick name with in the first days. Every one would call out, "Keep Left". 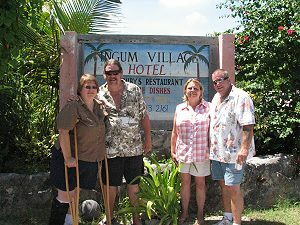 Tingum Village has its own bar and restaurant, and if you catch fish or seafood, they will cook it for you.